Welcome to Birthday Bouncers, one of the largest collections of bouncy castles in Poynton! 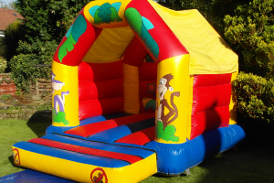 Established in 1995, Birthday Bouncers have been delivering bouncy castles throughout South Manchester, Cheshire, Stockport, Altrincham, Wilmslow and Poynton for over 15 years. Over that time we have built up an extensive range of childrens and adult bouncy castles. 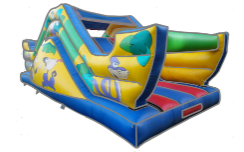 In recent years we have also added Obstacle Courses, Inflatable slides, Sumo Suits and even Gladiator Duel podium sets to our extensive range. Birthday Bouncers are a bouncy castle hire company operating in Poynton we are part of BIHA (British Inflatable Hirers Association) and offer one of the most high quality and reliable hiring services in Poynton We at Birthday Bouncers take safety very seriously, all of our castles are safety checked and our staff are trained to provide you with the most smooth and stress free service we can. 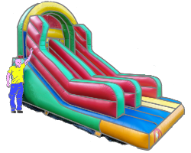 If you need a Bouncy castle hire company in Poynton then we are the company for you! Even though they are a relatively new addition to our catalogue, both Sumo suits and our gladiator duel arenas have proven to be a fantastic hit at both children's and adult parties, the sumo suits come with a full body suit and a head and neck guard. Our gladiator duel arena is an inflated platform with two solid stands mounted on it, the object of the game is to stand on the padded platforms and use the supplied baton to knock your opponent off the opposite platform, for more information regarding our gladiator duel arenas or sumo suits simply click the link above.